Pretty Vicious, all still teenagers, could be the saviours of their generation. Or not. Either way, they make a refreshing change from the awful nonsense that passes for pop music these days. The thing is, they already have a massive following - according to this article from the good old Beeb, fans in Japan wait for them at airports, and they had to turn down a support slot with Muse owing to "not being ready"; it would have been only their fifth ever gig! A new four-track EP called 'Cave Song' was released less than a fortnight ago. I absolutely insist that you check it out. The video could double as a tourist information film for their hometown... 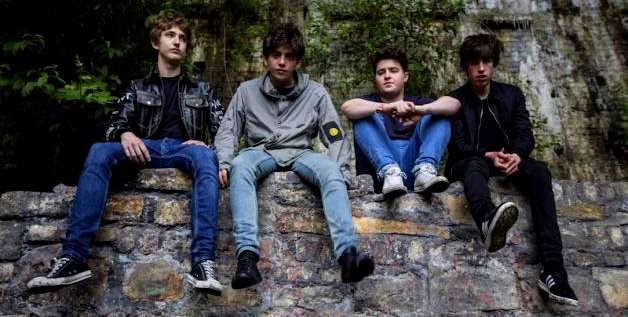 In the meantime, soak in this supercharged dose of new Welsh rock. The kids are alright. The legendary Rockfield Studios in Monmouth, where Queen recorded Bohemian Rhapsody, Oasis recorded 'Morning Glory' and Simple Minds made their seminal 'Empires & Dance' album, is the subject of a summer-long exhibition at Monmouth Museum. It's been put together by A-Level students at Monmouth Comprehensive School and is rammed with all kinds of interesting items, including Noel Gallagher's Wonderwall acoustic guitar! All museums in Wales have free entry, so it's a no-brainer if you're in the area. I live less than half-hour away so I'll be popping in. Also, if you were ever a Gorky's Zygotic Mynci fan, there's a free tribute album available for download from Recordiau Prin (or Rare Records, if you prefer). 32 tracks in all! I jumped to the video of 'Cave Song' first and, after scraping myself off of the wall, checked out 'Are You Ready For Me'. Talk about a band emerging fully formed! A very, very impressive noise. Don't know any of these bands, but I'm enjoying the tribute album. Thanks for mentioning. That exhibit sounds wonderful. I was looking at the roster of artists that have recorded at Rockfield Studios... wow! Many thanks for the heads-up about the tribute album. Looking forward to listeming to it in coming days. A load of stuff with some nonsense thrown in. Some of it autobiographical, some of it informative, some of it amusing and some of it that is none of the above. But all of it is about music and my obsession with it. All articles Copyright of TheRobster and credited contributors. Powered by Blogger.